🏒 Pucks drop tonight as the 82-game NHL season begins. In D.C., the reigning Stanley Cup champion Capitals will raise their banner before playing the Boston Bruins. President Trump is increasingly fantasizing in public and private about his 2020 campaign, using midterm rallies to talk as excitedly about his own re-election in 2020 as he does about the 2018 races that are just 34 days away. Last night in Mississippi, he even promised "we will do a landslide" in 2020, after a razor-thin electoral victory (and substantial popular vote loss) in 2016. "Who the hell’s gonna beat us? Look! Who's going to beat us?" Trump asked, after amping up his frequent riff about former Vice President Joe Biden as a lightweight he'd love to crush. A former aide told us: "The greatest moment in Donald Trump’s life was when Hillary Clinton called and conceded the 2016 election. Nothing about actually being the president has ever lived up to that." "It was the ultimate validation for someone who’s been searching for it his whole life," the former aide continued. "That’s why he relives it constantly in conversations and during rallies. So it’s no surprise that he wants to reach that validation high again, which is why 2020 is never far from his mind." 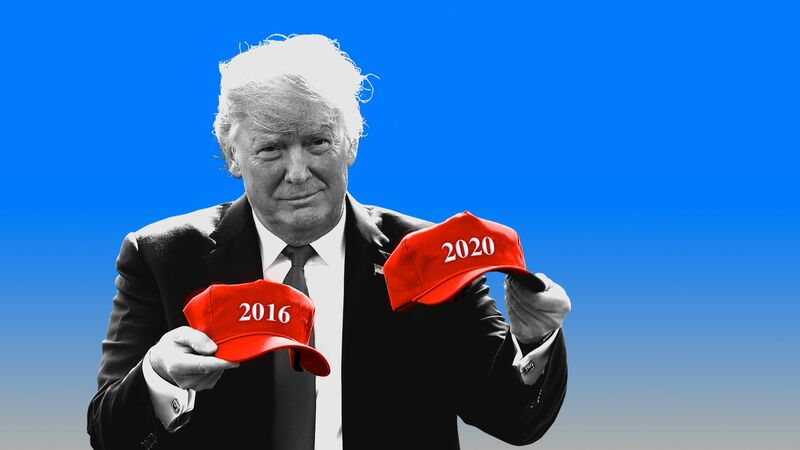 Behind the scenes, Jonathan Swan reports, Trump has been talking quite a bit about 2020 — not in terms of strategy or tactics, but in a disorganized, riffing way, based on whatever or whomever is in the news. The potential candidate he talks about most: Sen. Elizabeth Warren of Massachusetts. "He seems to think she’s going to be the nominee," one source said. Advisers have told Trump he’d be in great shape if she is. Trump has made fun of Sen. Cory Booker of New Jersey ("Spartacus") and Sen. Kamala Harris of California after watching the Kavanaugh hearings. Trump thinks "Crazy Bernie" Sanders is talented — he respects that the senator from Vermont fires people up and built a movement. The president thinks Bernie tried to do what he did in 2016, but didn’t quite get there. Trump has mused in private about Mike Bloomberg. At the end of an August interview with Bloomberg News, Trump told the journalists: "Say hello to Michael." Trump says Oprah will never run. “Everyone loves her and the minute you run for president, that changes,” says Trump — who would know. Swan reports that if Trump is worried about any candidate in particular, it's not apparent to sources close to him. Biden seems to be the potential opponent Trump's staff worries about most. Advisers worry he’ll steal Trump voters from the Midwest, and cut into the president's dominance among white men and whites without college degrees. But Trump genuinely doesn’t appear to his aides to be worried about Biden. As onstage, Trump says Biden is a joke — and claims that once the spotlight is on him, "bad stuff" will come out. Chaser — Boston Globe's Victoria McGrane: "This year, women politicians are showing their anger in ways that depart starkly from the well-worn rules that said they could not show their emotion lest they seem unbalanced, hysterical, threatening, or otherwise veer from societal expectations for the proper way women should behave." "Michael R. Bloomberg, the billionaire former mayor of New York City who is considering a 2020 presidential campaign, will give $20 million to the main Democratic Senate super PAC this week," the WashPost's Bob Costa reports. Why it matters: "Bloomberg’s intervention bolsters the Democrats’ Senate chances by infusing significant late-season capital into the Senate Majority PAC, a group that had $29 million on hand at the end of August and has been purchasing advertising in expensive media markets." "Bloomberg ... says the emotional national debate over ­... Kavanaugh has energized Democratic voters and provides an opening for the party to be more competitive in rallying women and swing voters." Be smart: A source tells Axios that Mayor Bloomberg intends to be the biggest digital spender in House races this cycle — an eight-figure spend across dozens of districts around the country that employs advanced targeting and multiple creative approaches. I'm told that Mike believes that Democrats were outgunned online in 2016. As the founder of an information technology company, he knows Democrats need to do better to win in 2018 — and beyond. He is determined to help make up the spending disparity online between Democrats and Republicans. "The North American deal — the U.S.A. — uh, uh — got to get this right — U.S.A.M.C.?" Separating Apple from Facebook and Google, Cook said: "We're not in the business of building the detailed profile of you ... The way we go into product design, we challenge ourselves to collect as little as possible. And when we have it, we challenge ourselves to encrypt it in the end." P.S. ... The International Conference of Data Protection and Privacy Commissioners (that's the international privacy regulators association) announced this morning that Cook will kick off the group's annual conference in Brussels on Oct. 24. The test wireless alert message will be sent with the header "Presidential Alert" and text reading: "THIS IS A TEST of the National Wireless Emergency Alert System. No action is needed." The message will be broadcast for 30 minutes, but phones should only receive it once. Starting at 2:20 p.m. on the East Coast, authorities will also test the nation’s broadcast emergency alert system, which operates through radio and TV stations. The presidential alert will be received by all U.S. wireless users who have compatible phones that are turned on and connected to commercial networks run by the major wireless carriers. Congress requires that the system be tested every three years. President George W. Bush authorized the alerts in 2006, but none has ever been sent. "What emerges from this body of evidence is a financial biography of the 45th president fundamentally at odds with the story Mr. Trump has sold in his books, his TV shows and his political life. In Mr. Trump’s version of how he got rich, he was the master dealmaker who broke free of his father’s 'tiny' outer-borough operation and parlayed a single $1 million loan from his father ('I had to pay him back with interest!') into a $10 billion empire." 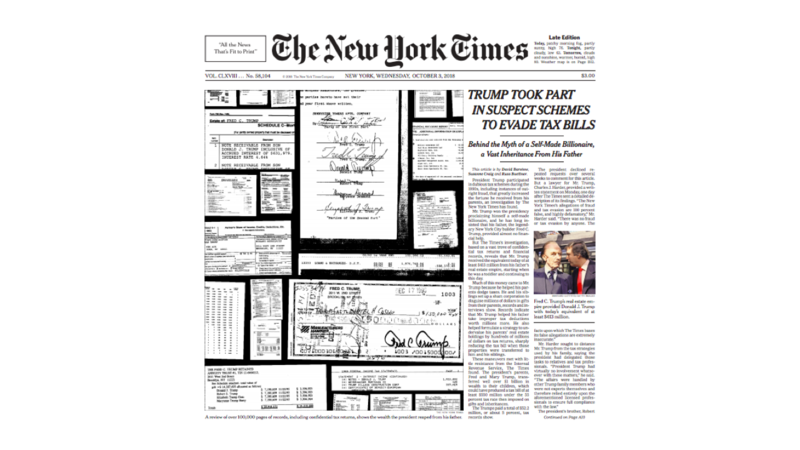 "The Times’s investigation ... [offers] the first comprehensive look at the inherited fortune and tax dodges that guaranteed Donald J. Trump a gilded life. ... [I]n every era of Mr. Trump’s life, his finances were deeply intertwined with, and dependent on, his father’s wealth." A hint: "John Walter, a favorite nephew of Fred Trump’s, died in January ... He ... was the unofficial keeper of Fred Trump’s personal and business papers, his basement crowded with boxes of old Trump financial records." 11 takeaways ... Statement from Charles Harder, a lawyer for Trump. "He's spun a fantastical story. ... There's hardly a grain of truth." "It's continuing till this day. He's going to get a payment from Starrett City, an investment his father made in 1972. He and his siblings are getting payments into this year. He's been getting payments into the White House from what Fred Trump did." P.S. 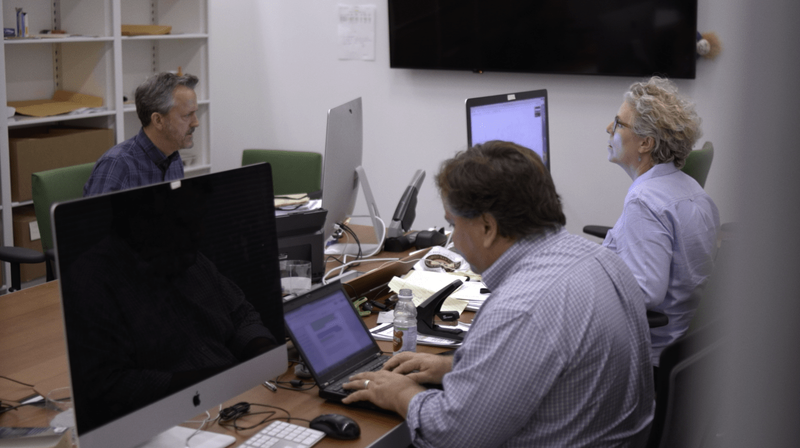 Showtime announced "The Family Business: Trump and Taxes," a short film about the story behind The Times' story, from the team that made the docuseries about paper, "The Fourth Estate." Premieres Sunday, 8:30 p.m. ET/PT on Showtime, after "The Circus." "But at college campuses across the country, counselors and administrators recognize that many students bring with them untreated trauma, contributing to memory impairment, insomnia, and heightened depression and anxiety." "In the past three years, the counseling center at the University of Central Florida [in Orlando] has treated a growing roster of students, said Teresa Michaelson-Chmelir, outreach director for the university’s counseling and psychological services." Context: More than 187,000 U.S. students have been exposed to gun violence at school since the Columbine massacre in 1999, The Post found in March. "It’s the first federal study to look at how often adults eat fast food. An earlier study found a similar proportion of children and adolescents ate it on any given day." "It’s based on a survey of about 10,000 adults over four years." "The study did not find a difference between men and women. But higher-income families ate fast food more often than lower-income families." Why it matters: "Health officials say too much high-calorie fast food can lead to obesity, diabetes, heart disease and other health problems."